Gut wrenching decision time... need community input. So yeah, in the next few months I'm determined to buy either an Xbox One or PS 4. I haven't pulled the trigger yet because I still love my 360 and it's getting the job done. Obviously when the majority of friends have moved on, I'll be left with largely empty GRID, Dirt, and Forza lobbies. Not an entirely bad thing, but the itch will be there until it's scratched and I'll have to upgrade. It's killing me inside, the choice. Yeah, it's a choice because I can't ever see myself dropping $900 on two separate consoles. On the one hand, there's the PS4 with its superior firepower, better framerates and resolution, which are sure to look stellar on titles like Project Cars. It has some other things going for it: more user-friendly with its controllers that charge via USB, accept any headset; the unbeatable MLB The Show which I love because baseball; the nagging feeling that many, many cross-platform titles will tend to look and/or play better on PS 4 (among these Diablo, the aforementioned Project Cars, Battlefield, et al.) At the end of the day, though, I've transitioned away from Diablos and Skyrims and Battlefields and Calls of Duty... so would this worry about processing power even matter in primarily sports games? On the other hand, the XBone has some superior stuff. The Forza series is a strong attracter. The idea of buying Horizon 2 and Forza 5 GOTY together with an XBone was almost overpowering recently and I almost caved. I really prefer XBox controllers. And I've had XBox Live for over 10 years—it would be hard to leave it. Playstation has virtually no chance of ruling racing with the strength of Microsoft's proprietary titles. That in itself is almost keeping me in XBone's corner. For anyone who's feeling my pain, or anyone who is dedicated to buying only one system... got any advice? GREAT NEWS! 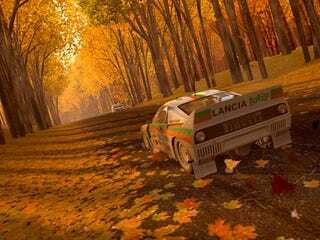 Rallying finally returning to consoles.